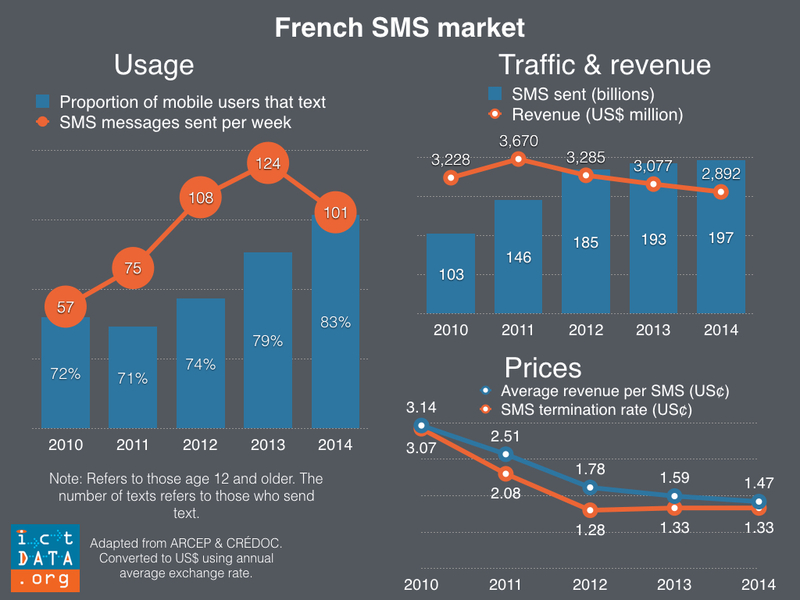 France is one of the more robust text messaging markets in the world. 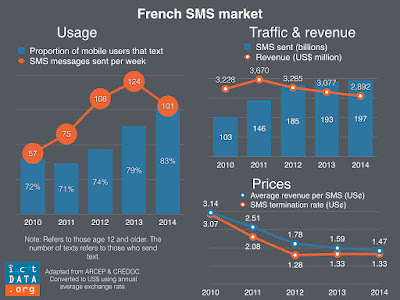 French mobile subscribers sent almost 200 billion SMS in 2014, making it the world's 7th largest market. Despite increasing competition from Internet-based messaging services, SMS and MMS revenues have declined marginally since 2010, from US$3.2 billion to US$2.9 billion while traffic has increased. One reason is the country has one of the lowest SMS termination rates in Europe (1.3 US¢), encouraging use. According to the French electronic communications regulator ARCEP, messaging made up 15.5% of total mobile revenues in 2014, unchanged from 2013. ARCEP will no longer publish messaging revenues from 2015 since bundling and add-on plans have made it more difficult and artificial to allocate revenue to different services. In terms of usage, France ranks 5th in the world with a mobile subscriber sending an average of 245 SMS per month. CRÉDOC ("Centre de Recherche pour l'Étude et l'Observation des Conditions de Vie" / Research Institute for the Study and Monitoring of Living Standards) carries out annual surveys on ICT use. In 2014 it reported that 74% of the French population 12 years and older sent SMS (equivalent to 83% of mobile telephone users). These users sent on average 101 text per week in 2014, but marked the first time usage dropped. This is more than 1.6 times the calculated figure which includes all mobile subscribers and not just those that text. From World SMS Markets 2014. Features 10 year time series of P2P SMS traffic for over 50 countries accounting for over 95% of the world SMS market as well as supplementary data for select countries (messaging revenue, SMS users (% of mobile users), SMS termination rates).To order, contact us.